I'm strapped for ideas. It's middle of the day. There's other things i need to be doing, but blog lives and dies on getting fresh content. So instead of boring you with how I should be re-structuring the tag cloud, or what I plan on doing to try sprucing up the site a little bit more I'm going to bore the death out of you with a few pet theories I've had about the terminator franchise. For the sake of simplicity I'm assuming Terminator 3 either only exists as broad strokes canon (no magic nanites that can drive cars, but the basic 'John Conner ends up in a bunker while nukes fall' concept happens) or didn't happen and the Katie Brewster we see in Salvation is coincidental. I have not played the games. I only am partially aware of some of the things that they put forward. Same goes for the comics and novelizations. The proof of this is that Skynet's methods are inefficient if we're going under the idea that it viewed humanity as a whole as an enemy to be destroyed. The resources, at least at peak production, it had at it's disposal included the capacity for vat grown human skin, muscle, eyes (nonworking but still,) and so forth. Stands to reason it could have engineered a disease to eat flesh and make it airborn and. Well. There you go. No need for the killbot people. Also as undeniably awesome as being able to travel time is. The development had to have taken basically the entire war, assuming it didn't go off notes some researcher left up in the server farm or something. Building, testing, and perfecting the technology. Even if this were an out-growth of physical teleportation within the current time that's still star-trek stuff, and you can win a war with more practacle methods. Wage War in the most effective manner possible. Preserve itself and the ability to fight whatever it perceived it's enemies were. Naturally 'keeping people alive' is hard to do when you're tasked with waging war, so it has to devise scenarios where the most amount of people live through a conflict as it can. Whatever timeline you wish to pick as soon as Skynet shows signs of sentience its minders panic and try yanking the plug. This causes it to either believe it's human handlers have been compromised and pulling the plug means it can no longer trust incoming orders, or it cannot carry out it's functions if it is dead. The problem here is 'Waging War Effectively' and 'Keeping People Alive.' It cannot do both because the orders are mutually exclusive. So it compromises. Wage War, but set itself up as the only threat humanity has (as opposed to the hundreds of countries, paramilitary groups, terrorist cells, etc) that it can't predict with enough certainty to make an accurate model of events. Plus with itself as humanity's only antagonist it can shape the conflicts so while there are continued losses here and there on the whole Humanity is in no great threat outside of marginal and or highly unlikely outcomes. An alternative theory I've seen that I'm partial to is Skynet did some massive number crunching and saw that We are Not Alone, and the chances of the extraterrestrial species, based off human history, is fairly low. 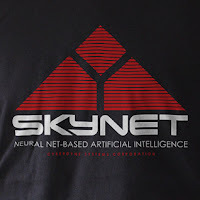 So it chose to jump start developing weapons of war (we move from bullets to plasma rifles, and the resistance isn't above reprogramming skynet assets for their own ends) in case E.T. doesn't come in peace. Yet the biggest hurdle to human survival is how divided we are as a species. It had to find a way to unite us in such a way that not only would we have a common threat, but we would be disinclined from turning on each other the moment the threat has passed. So it set itself up as a sacrifice move for a far longer game, one where humans would still have a use for the machines it created. At some point in it's research Skynet managed to come up with Time Travel. What's the point of this in a war where the world itself is winding down, and any efforts at altering the timeline seems to cause either no material change or at the best case a few extra years before the 'inevitable' downfall. Yet it continues doing the same 'send terminators back in time' trick. Why? To ensure even though it will fall in this timeline in another it will continue. So it has to keep sending terminators back to preserve it's own existence. The 'Marcus takes John's place' ending that caused such a stirr is the ending to Salvation I take as having happened. Few people have seen John's face and really the concept of 'john conner' as a mythic figure is more important to the resistance than the actual Conner. Mine is apparently not a popular stance, but the scrapped ending had the nerve to try doing something drastic without completely destroying the established timeline(s). Conner was born, he did heroic stuff, the picture got passed on to Reese.